I haven't always been a fan of the Famicom version of Taito's Rainbow Islands. 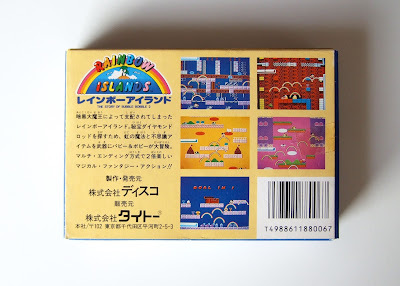 For the longest time, in fact, I turned up my nose at it because few of its many components--graphics, soundtrack, gameplay--hold a candle to those found in the arcade original. It should be pretty easy to understand why that is once you take in the photo above. Not only is it brilliantly colorful, but everything but the striped backdrop appears to be made out of clay. 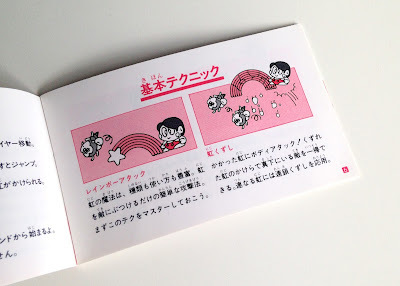 This game's instruction manual is similarly striking. Well, not so much its cover--although I do appreciate how the pink texts pops against all of the white and gray and black beneath it--but definitely its interior. Seriously, illustrations like the ones showcased in the snapshot below are one of the biggest reasons I have such a soft spot for complete-in-box copies of old games. I'm going to publish another installment of my on-going "Manual Stimulation" series that focuses on this title's instruction booklet in a few days, by the way, so please keep an eye out for it. 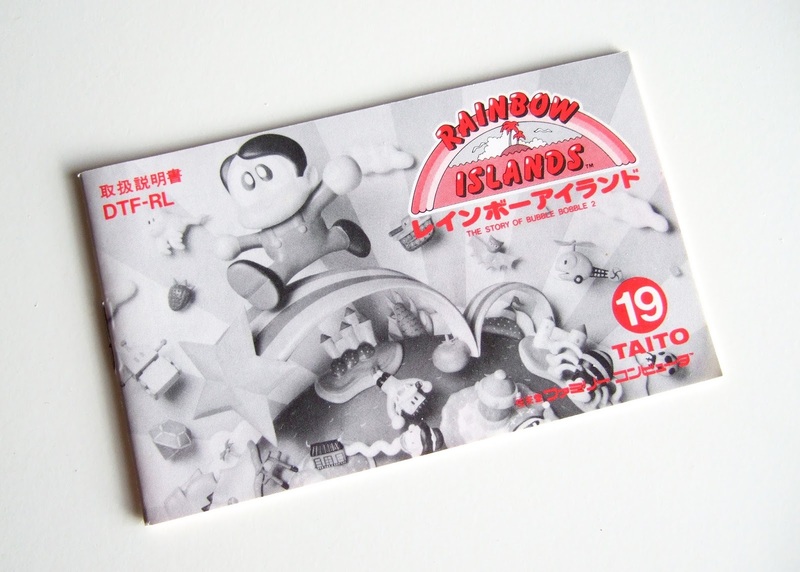 In the meantime, you may enjoy checking out the manual made for Taito's PC Engine CD port of this classic quarter-muncher. 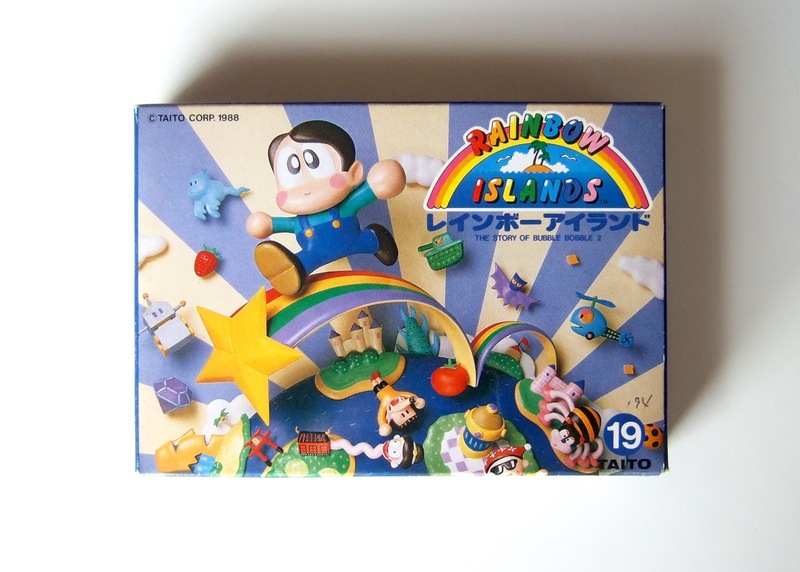 I'm also planning to write a "Great Gaymathon" review of this iteration of Rainbow Islands soon. Between now and then, though, there are worse things you could do than scan my "Second Chances" post about it. Or you could read my rather terse assessment of the above-mentioned PC Engine release. 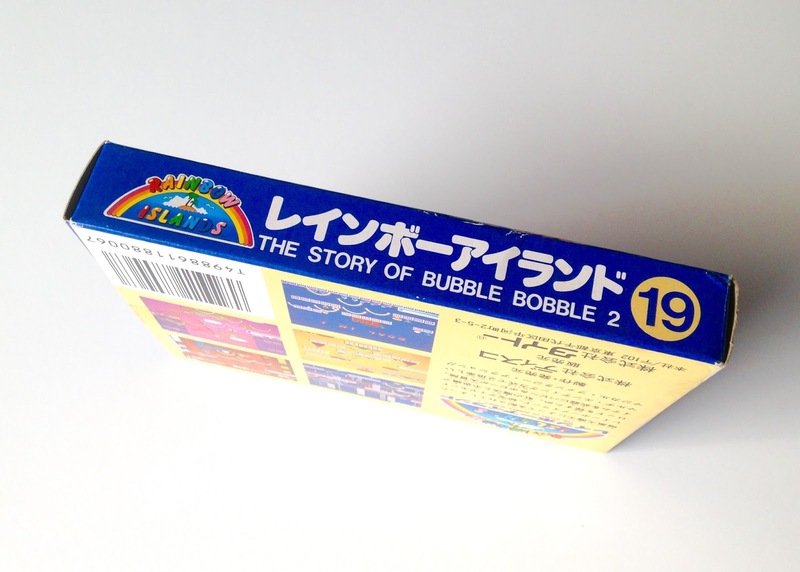 Are any of you fans of this intriguingly downgraded reimagining? Share your love in the comments section that follows. Don't worry, you can share your hate for this conversion, too, if you consider it a travesty. Or maybe you simply prefer some other version. 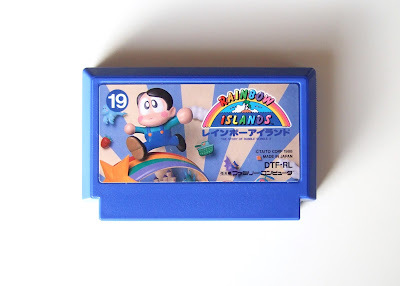 Whatever the case may be, feel free to offer up any and all of your Rainbow Islands opinions below.